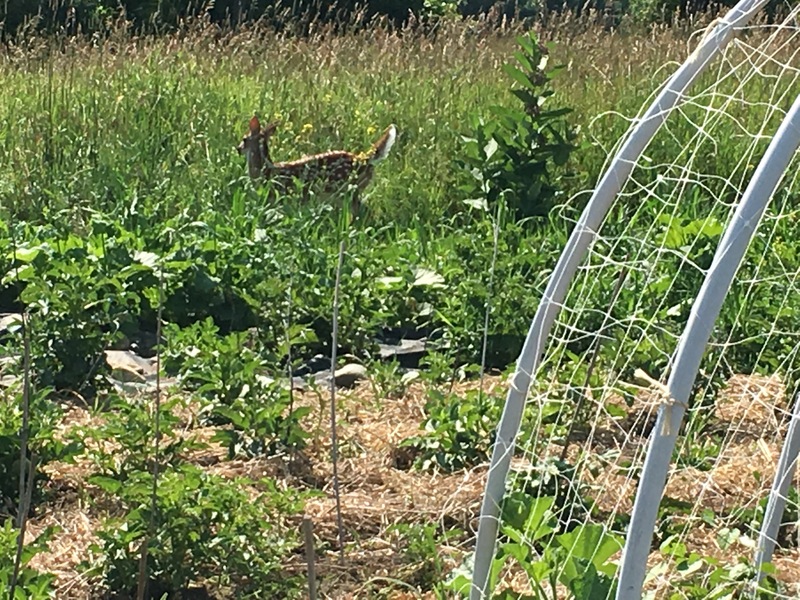 The deer population has exploded in our neighborhood and consequently most of the Flowers and vegetables in the gardens have fed frolicking families of deer (and no humans). Every time I get really cross with the deer, say for eating all the day lily buds during an evenings stroll, I stumbled on a spotted fawn tucked in the grass of our hayfield. It is hard to be furious at a fawn. Yesterday a pair of fawns ran in front of me then tucked themselves in the grass to look at me. WITH FAWN EYES. It’s an understatement to describe fawn eyes as irresistible. Where was mom? Probably in the main vegetable garden chewing the last of the cucumber vines or making sure she had eaten every sprig of Sweet Pea. I haven’t completely thrown in the towel on harvesting SOMETHING from the gardens. As you know from a previous blog post, I made a fence around the bean garden to stop the deer from eating all the bean plants. This was an enormous flop as the deer sailed over my six foot effort as if it wasn’t there. Frost cloth was my next effort. I covered the bean spiral with this frost cloth and anchored it all securely to the ground. The deer quickly learned how to pull up the frost cloth, anchor pins and all. Each morning I repair the damage. I think there are beans under some of the frost cloth. It could just be crab grass. I don’t really think any surviving beans are enjoying their summer under cloth even though as a self pollinating crop this should work. Should being the operative word. 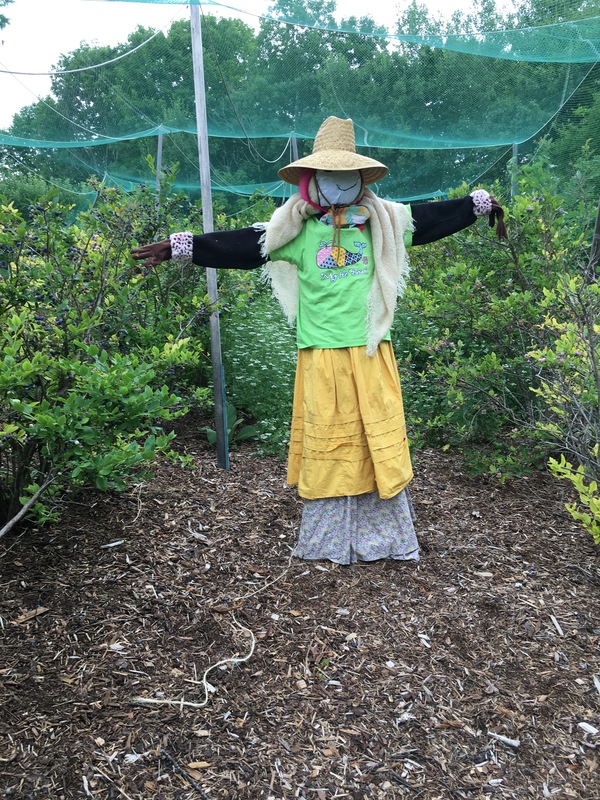 With the gardens under siege, you would think that the netting I have over our blueberry patch would be a bright spot of bird and animal free harvesting. This net is easily 150 feet by 50 feet, and it is draped over a wooden frame high above our blueberries. The netting is anchored around the outside of the patch with 2x4s and other long pieces of heavy piping, You’d think this would be enough. But it’s not. Nor was the scarecrow Grace and I made a deterrent in any way. I don’t think it has scared off a single bird. You’d think faux fur gloves would do the trick, but no. Squirrels, chipmunks and ever so many birds are constantly working the perimeter like the raptors in Jurassic Park. Once one (or five) of them find a way in (and they always do), I have to roll up a corner of the netting and shoo everyone out. Every time I free a bird or squirrel that has broken in but can’t break out, I talk firmly to them, “Stay out and tell your relatives to stay out too. I’ll give you your share of the harvest as soon as I have taken our share.” After about an hour, their nephews or cousins, aunts and uncles disregard the information provided by their newly freed relatives and give it a try. It doesn’t help that Sheba finds it very entertaining to bark at everything that gets trapped inside the netting. One thing I have learned during my efforts to free imprisoned blueberry thieves: There is nothing quite like being charged by a squirrel on the run.. It’s completely adrenalizing but somehow very funny too. So what with the nonstop deer festival, complete failure of my protection measures and a growing season without rain ( until this week) the gardens are not looking their best. All during this time, the Angels have continued to have me do the detailed energetic cleaning and clearing I wrote about in a blog post earlier this summer. And, surprisingly, the Angels tell me the gardens’ vibrations have never been better in spite of what things look like. Sometimes when I stop chasing deer (they hardly move when I come out to shoo them away), I can feel the wonderful vibration too. It’s such a good reminder that we can never tell what is happening by appearances. The Angels also remind me frequently that things often look worse before they look better. They also note that the appearance of things is not the reality of things. Beyond the comfort this brings in regards to the events in the world, these pep talks also reminded me of this small organization that the little village of Meriden began in the 1980’s when nuclear war between the Soviet Union and the United States felt dangerously close. When some very sweet buddhist monks walked through town on a peace march, it galvanized a group of us in town to start the Meriden Peace Trust. It was not a religious organization or a political one. I am not sure any of us had a clue what we could do, but the next thing we knew, we were sending various people from our town to the Soviet Union on community exchanges. 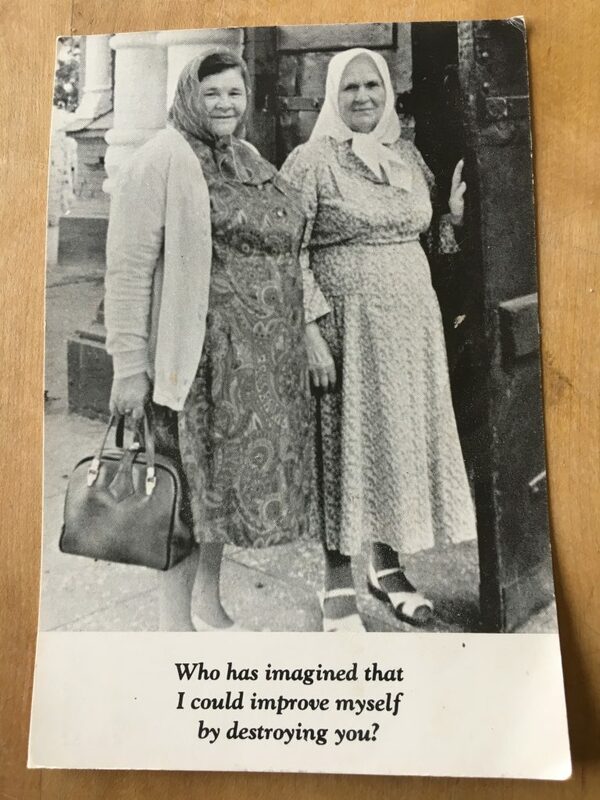 The sentiment behind the exchanges was summed up by this postcard which I kept close then and keep close now. We sent school children and grandmothers. We sent the postmaster’s wife and the town plumber. And soon Soviet citizens were also coming to Meriden for potlucks and homestays. Cynics said that the Soviet Union was only sending us communist party members. All we knew was that the first place the lady visitors wanted to go was to JC Penney’s for some American underwear. This seemed pretty normal to us, especially after our visitors told us that bras were almost impossible to find in Soviet shops. I don’t remember how we funded this. I think we must have sent out letters to folks to raise the money for airfare for those we sent abroad. I just remember the gatherings with or visitors where hopelessness was left at the door and we ate together and danced together and heard each other’s stories. Some would say our efforts couldn’t possibly have made a difference. But who knows. It seems to me that these small acts of kindness and connection are the only thing that matters. And these small things are always possible for us to do. I can continue to talk gently to the deer to encourage them to share the gardens. We share this world and these gardens together even if imperfectly. I can continue to laugh with the nutty squirrels and not take myself so seriously about the gardens looking so bedraggled. The mail today was so full of loving letters from you. These cards and letters lifted us up. Not only had the deer eaten every edible in the garden, but we had an enormously busy week with almost everyone on the staff out on vacation. Your cards perked me up. They perked up the skeleton crew here.. We had a skip in our step after I read all the notes aloud. We finished the day in high spirits. And as far as what’s for supper, there is always the farmstand down the road. Last time I checked the deer didn’t have the cash for raiding that place.